February 8, 2012, approximately 2:50am- I woke up my husband. Yep, I am definitely feeling contractions. I had lost my mucus plug all throughout the day the day before. I wasn't alarmed by that. Obviously, I knew that we were one step closer to welcoming our baby girl into the world, but I also knew that you could lose your mucus plug a couple of weeks before birth. So, it could have meant that nothing would be happening any time this week. My husband started timing the contractions. There was no pattern. One would last a few seconds and be followed 7 minutes later by another one. Then the next one would last 30 seconds and it would be 13 minutes until the next one. And this would be my entire day- on and off contractions, no pattern, erratic intensity, confusion, and limbo. To be on the safe side, my husband called off from work for the day, and I called my mother and put her on alert. My mother & my husband would both be my birth partners for this miracle. We went ahead and made sure the hospital bags were packed and ready to go just in case. 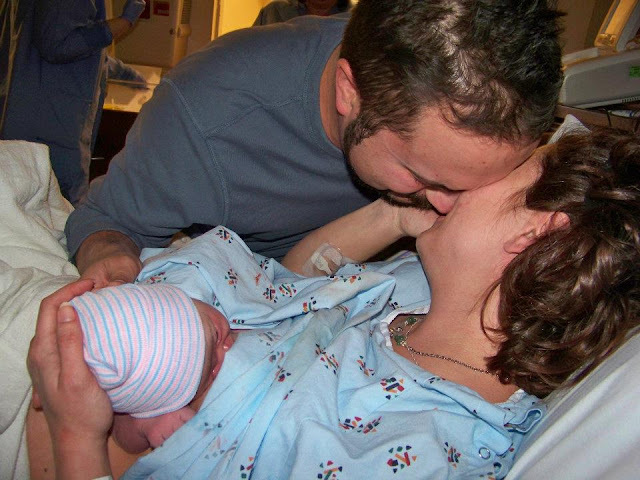 At around 1pm, I decided it was time to call my midwife. The lack of pattern (yep, we were looking for that whole 5-1-1 deal) had become frustrating. Sometimes the contractions would stop altogether for 30-45 minutes and then start back up again. My midwife had us come in and she checked my cervix (I mean, she actually grabbed my cervix!). I was still 50% effaced, but had progressed to 3 cm. But then again, that could mean everything or nothing. As my midwife told us, I could go into labor in a few hours, a few days, or some time the following week. At this point, the frustration and lack of sleep from the night before started to get to me. I begged for either the contractions to stop or for something really definitive to happen- like my water breaking- to get this show on the road. At around 4pm, I decided to take a nap. I was exhausted. The contractions and 4 hours of sleep from the night before had started to take their toll. My lower back was aching, so I laid down with my heating pad and fell fast asleep. That didn't last very long. For an hour and half, the contractions came consistently at 10 minutes apart. But they didn't intensify and they didn't get any closer together. My husband plays tennis every Wednesday evening with my dad, and I told him to go ahead and go. If I needed him, he would be less than 10 minutes away anyways. But I really didn't foresee me going into real, 5-1-1 labor any time in the next couple of hours. I decided to get up from my nap. I was achy and thought that maybe walking around would help. I put a frozen pizza in the oven and tried to go about my usual routine, but something felt off. I couldn't concentrate. My body just ached. I started wondering what the hell I was thinking putting a pizza in the oven! By chance, my mother decided to stop over and check on me after she got off from work. Never was I so glad to have my mom just drop by. Shortly after she arrived my contractions started to intensify. I had to stop what I was doing and work through them. Right away, my mom knew what was happening and started timing them. Forget 5-1-1. That never happened. My contractions just steadily got stronger & closer together within an hour. It was time to call the husband home from his tennis date with my dad. It was time to head to the hospital. We arrived at the hospital and they checked me into triage. I had no idea what to expect. This was all new territory for me. My son was born over 13 years ago via a scheduled induction. I had no idea what non-Pitocin induced, natural labor felt like (although I was now getting a very good idea of it!). I just knew that every time a contraction came, I had to stop and lean on my husband or mother and squeeze their hand. I was scared, I was excited, I was nervous, and I was ready. After it was determined that I was indeed in labor and dilated to 4cm, I was admitted to labor and delivery. Right before we left triage, I felt warm liquid on my leg. I was about 99% sure that my water had just broke. My midwife wasn't as convinced. She thought it was just jelly from my cervix check. But the contractions got much more painful, and my rests between them got very much shorter after that happened. As I walked into the labor and delivery room that would become our "home" for 3 days and 4 nights, I already knew that at some point that evening I would probably be singing (or maybe screaming) "Coqui". In my birth plan, we had decided on as much of a natural birth as my body and pain tolerance would allow me. Ideally, I wanted to go completely pain medications free, but I also knew that flexibility was key. My husband and I had a code word. One word that if uttered from my lips meant that I truly, really wanted an epidural. One word that could not comfortably work itself into normal labor and birth speak. The word was "Coqui". The tiny singing frogs that my husband and I had grown to love while spending our belated honeymoon in Puerto Rico this past June. We had found out we were pregnant with this precious angel the day before we left. I told my midwife my fears that I didn't know how much more of the labor pains and contractions I could take. The pain was intense. What if this lasted for hours and hours? I was already exhausted from being up since 3am that morning trying to time the contractions and desperately trying to see a pattern in them. Physically I was already depleted. She suggested I try the shower with the detachable massaging shower head and see if that helped. While I sat on a birthing ball in the shower, my mother and husband took turns aiming the warm water at my still big with baby belly, holding my hand, trying to encourage me to breathe. Even though I have practiced yoga for YEARS, I still tense up and have a hard time taking deep breaths when in pain. I made it almost another 2 hours without pain medications by sitting in that shower. My body started to shake with each contraction, the pain was intense. I looked at my husband and said "Coqui" multiple times. He went to get a nurse and my midwife to ask for the epidural. I wasn't disappointed in myself. I knew I had went as far as my body was going to let me. I felt a sense of accomplishment and satisfaction that I hadn't caved sooner. But I knew my body's limits and I was at them. The anesthesiologist came in to start my epidural. Once he finished, he sat in the room with me to make sure the medication was taking effect. It seemed to take the edge off of my pain, but I could still feel my legs, I could feel the catheter they had put in, and I still knew when I was getting contractions. Having had an epidural with my son, I knew what one should feel like. This didn't feel the same. I thought maybe I had just had a stronger epidural with my son. But then I started feeling contractions again, but just in one isolated area. What was going on? They called the anesthesiologist back in, and he decided to add a Fentanyl dosage to my epidural drip. Immediately my vision became jumpy. Breathing felt difficult, and my pulse rate dropped. The nurse asked the anesthesiologist if he would like an EKG ordered. What?? What was happening? I started to panic a little. Was I okay? Is the baby okay? Eventually my pulse went back to normal and even though I wasn't completely numb, I felt less pain. Everything was fine... for about 45 minutes. Then I started feeling my contractions again full on. I remember telling my husband that it wasn't fair. I wasn't supposed to be feeling these. I had broke down and asked for the epidural... for nothing?? The nurse called the anesthesiologist back to my room. He decided to just redo the epidural altogether. Once he had pulled out the original epidural catheter, he found what the problem was. There was blood in the catheter. The catheter had nicked a tiny blood vessel and part of my epidural medication was going directly into my bloodstream. That explained why the Fentanyl had affected my vision, breathing, and pulse so quickly. He redid the epidural and then I just went numb from the waist down. Relief at last. I fell asleep shortly after. I knew I needed a little rest. Myself and my body would have another big and miraculous task still to accomplish and it would be happening sooner than I had anticipated when I had closed my eyes for that nap. About 20 minutes after I had fallen asleep, our labor nurse came in to check on baby girl's progress. She looked up at me and told me that her head was in the birth canal. I asked her if she could see her head and she said oh, yes. My husband could see her head from where he was sitting across the room. I was a little taken back because I had felt absolutely no pressure, no urge to push. I worried about how long my baby girl had been in that holding pattern. She called my midwife in. In a few short minutes, my hospital room was filled with nurses and hospital personnel. It was time. Our sweet baby girl would be coming into this world soon. My husband had decided prior to her birth that he wanted to be the one to deliver her and place her on my chest after she was born. At first he was hesitant at even the thought of being down there, close to where all the action was taking place. But the more he thought about it and the more we talked about it with my midwife, the more he knew that this was a once in a lifetime moment that he did not want to miss for anything. With my mother and nurses by my head, holding my hands, and encouraging me; and my husband and midwife preparing to help bring our little girl into the world, it was time. I was ready to push. At 3:56am, I started to push in our dimly lit L&D room. Within 17 minutes, our sweet baby was on my chest and in my arms. My husband did an amazing job of delivering her (with some fabulous coaching from my midwife). There are no words to explain the joy, the pride, the love I felt when I looked at my baby girl's face for the first time. The only words that I could utter was, "She's so tiny!". We delayed the cord clamping, and all the measurements and statistics and just spent the first hour of her life outside of me together. As a family. For the first time. My husband and I broke down into tears together as the reality of what had been happening in my womb for the past 9 months finally hit home for us both. She was actually here. Safe and with us. Finally. Thanks for detailing the full story! She is just beautiful. Congratulations!